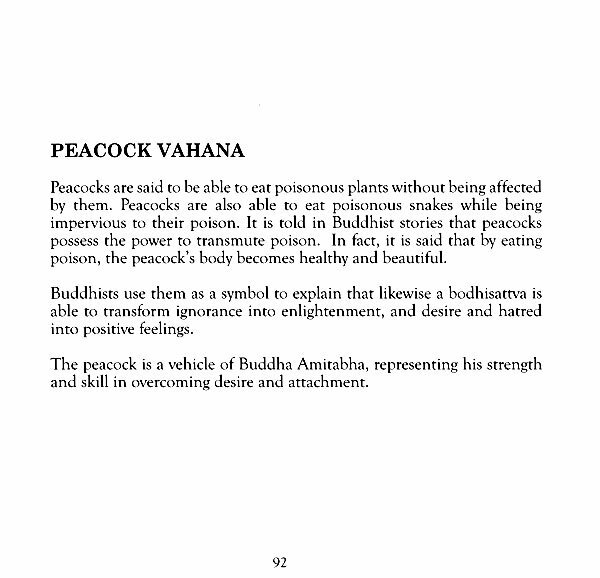 The intention behind this little book is to introduce the world of the mythical creatures which are symbols used in the sacred arts of Nepal and the Kathmandu Valley. 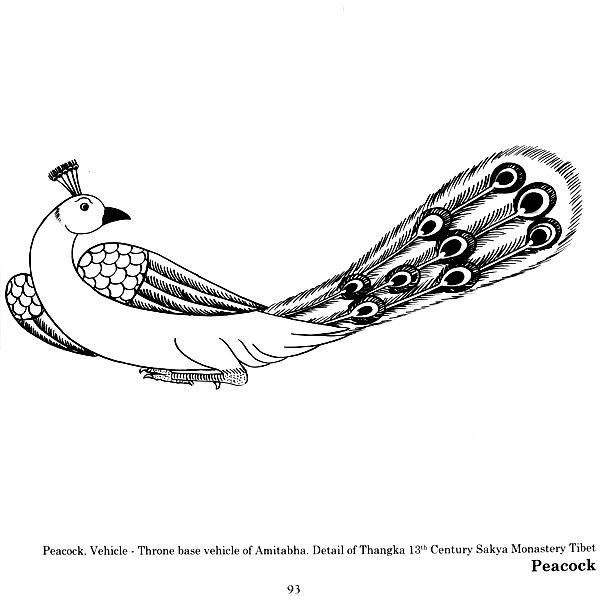 It is not designed as an academic study of these animals but is a collection of sketches and drawings of the animals that intrigued me, and needed explanation as I was learning to paint tangkas and paubas in Nepal. Sources consulted include electronic resources, books, academic papers, museum labels, pundits, gurus, teachers and friends. I thank them all for their contribution to the written information which provides a simple framework of myths, legends, stories and explanations. 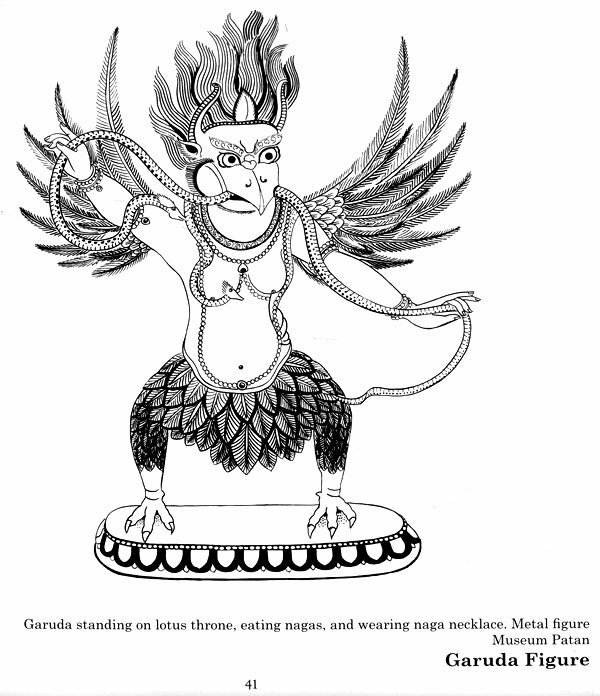 The illustrations are sketches drawn from the formal paintings, wood, stone, brick carvings and metal work which abound in every region of Nepal. The viewer needs to look closely at the creatures, not only identifying their overall form. The details open another world which illustrates the stories, myths, legends and rituals of Nepali life of which these animals are an intrinsic part. 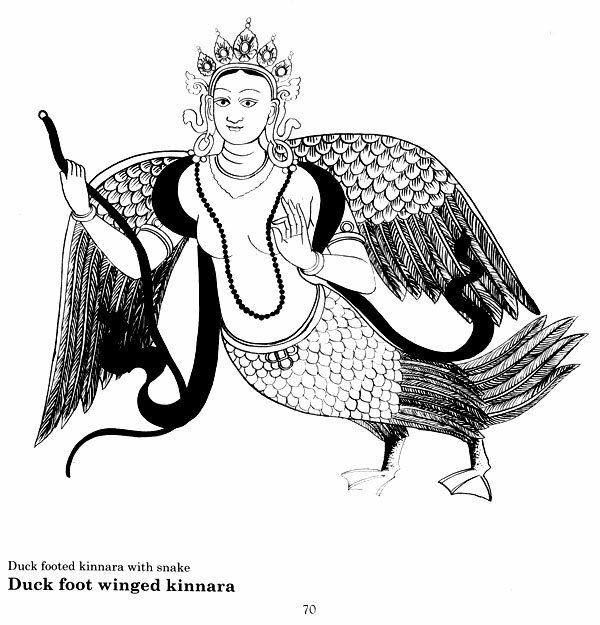 I hope that this is a useful introductory resource which can be used as a key to the names and basic information about these wonderful mythical creatures of Nepal. As this is a new field of study, without one extensive anthology, we would like to build up resources and information. If you have any corrections, contributions or information, stories, images or information about Nepali or Newari symbology, religious iconography, ancient lore or rituals. Your input will contribute to upcoming editions and to the pool of information, ensuring it is passed on to future generations. Sudarshan Suwal began studying painting at age 12. He received most of his training from his grandfather, a master of Newari Buddhist style of classical painting and a tantric practitioner, so Sudarshan's education included instruction in meditation, mantra and visualization, as well as drawing, making pigments, and painting. 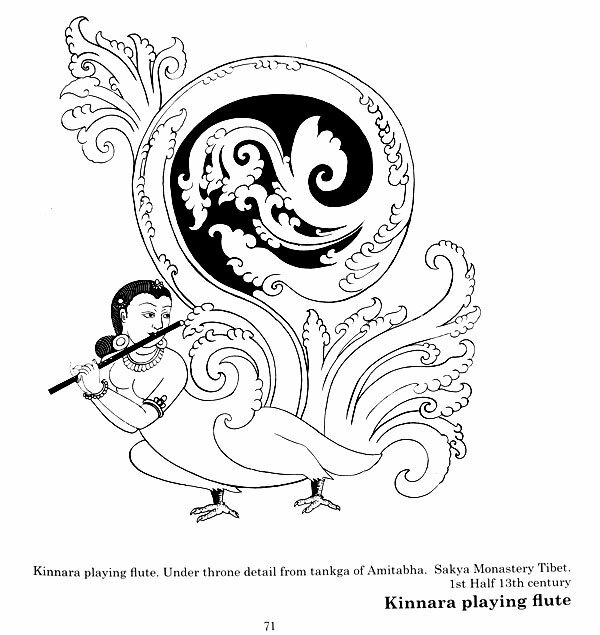 Classical scroll paintings in the Newari tradition are called paubha, (tangka in Tibetan). Sudarshan paints today using traditional materials and explores styles of Newar artists throughout the centuries. Sudarshan is recognized as one of the finest traditional painters in Nepal. He has won prizes in national competitions. He has painted wall murals on several temples in the Kathmandu Valley including temples at Swayambhunath, Bijeshwori and Gophal, and the Vajrayogini temple in Sankhu. His work has travelled with students and lovers of Nepali art to places throughout the world, and has been exhibited at solo shows in Nepal and in Denmark. Toni Sanders An Australian with a formal training in education, visual art, conflict resolution, Toni has been practicing as a ceramic artist for some years in her studio at home. While her heart is with her family and friends in Australia, during her life she has lived in countries as far afield as New Guinea, Indonesia, Croatia, Azerbaijan, East Timor, Nepal and Kosovo. This has given her many windows (mirrors) to view the world through. Living in Nepal provided the opportunity to undertake training in Buddhist tangka art, initially studying for several years at Shenchen monastery in Karma Gadri style and also with Sudarshan Suwal studying classical Newari styles using natural pigments and minerals. Without the guidance of my teachers, especially Sudarshan, also Alan, Rikki, Ramesh, Pawan and his publishing team and all supportive friends this small book would never have turned from an idea to a reality. 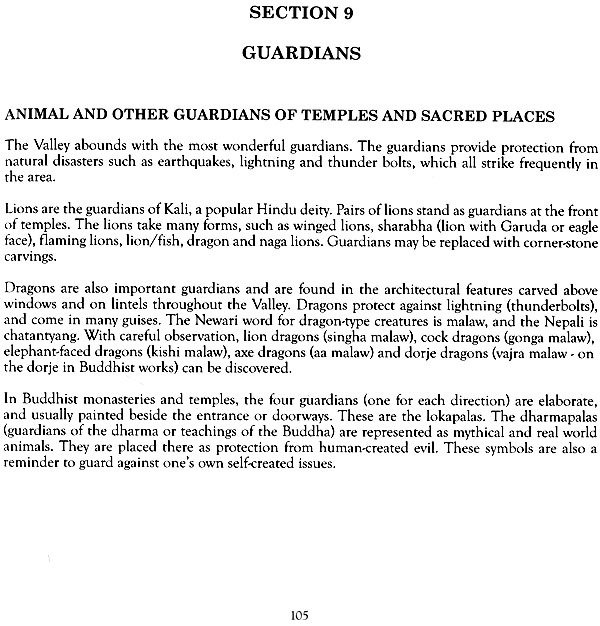 Wonderful mythical creatures have guarded the deities that are the focus of the beliefs of the people of the Kathmandu Valley for centuries. 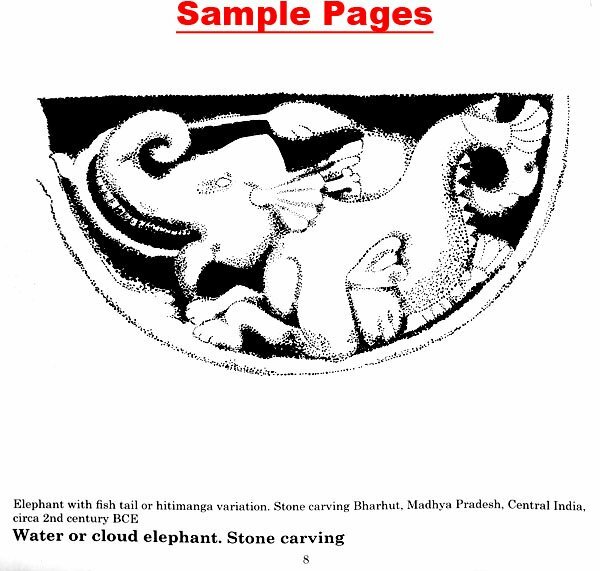 They are found in temples, palaces, shrines, stupas, and houses, as carvings in wood and stone, in metal and ceramics, on doors and window edgings and coverings, on lintels, in and around the thrones of the deities. They are painted on walls inside and out of buildings, in traditional Paubha (Newari thangka paintings) and they adorn prayer flags. Throughout the valley there are many mythical creatures. It is said that there are literally thousands of deities in Nepal. Each deity represents deep philosophical beliefs. 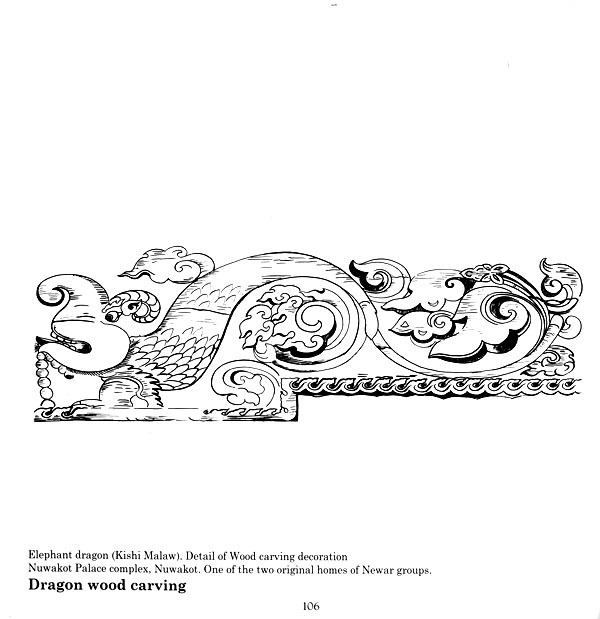 The animals and decorative pattern work that surround and guard those deities provide a framework of deeper cultural meaning that underpins and supports the deities. Academic studies of the deities and the patterns abound but less is written about the wonderful mythical creatures and the sacred animals. Much is written about Indian and Tibetan symbols but less is published about the Nepali & Newari iconography and its local interpretations. Mythical and sacred creatures, patterns and symbols which are used in the decorative supports that cover so many sacred buildings, shrines, and water features provide the groundwork on which the deity practice is established. Their roots are in the water supply and the cycle of life that underpins festivals, activities and religious practices performed on daily, monthly, annual, or other regular life-cycle events. 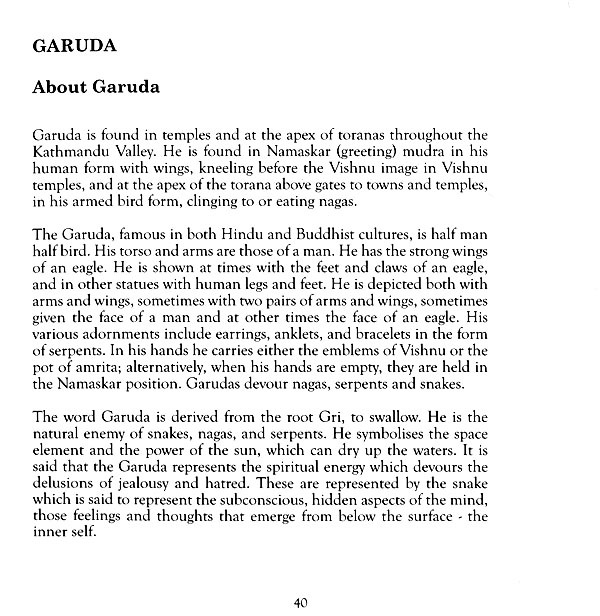 This small book of illustrations is an introduction which is designed to open the eye of the reader, inviting you to delve a little deeper into the details of the mythical and sacred creatures that are such important elements of the structures surrounding the better known deities. 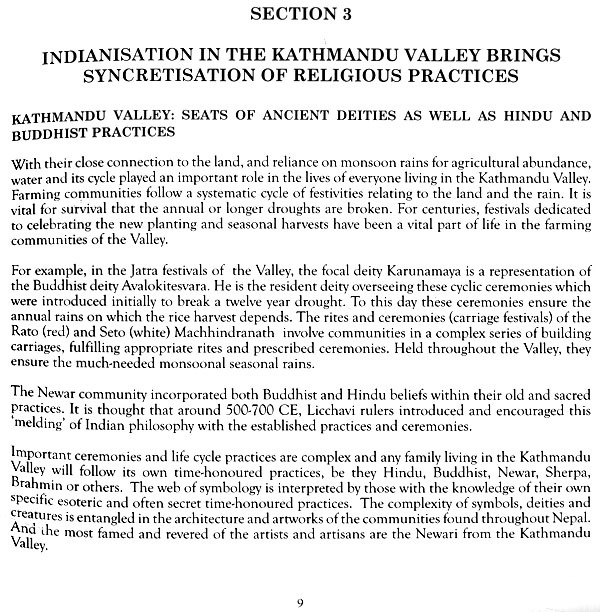 It is my hope that looking at these elements will bring you further understanding of the people who have lived in the Kathmandu Valley and surrounding areas for over 1000 years. It is thought that Newari craftsmen coming to the Kathmandu Valley from the fallen Indian Pala Sena dynasties (8th- 12th century CE) brought with them highly trained artistic skills along with knowledge of religious Buddhist and Hindu philosophy and its artistic background. Newari artists are famed for their fine detailed skilled work-person ship, and their creative approach to their work. The fine workmanship of the Newari artist and craftsmen was highly sought after from as far away as Nepal's northern neighbour, Tibet, where Nepali artists were sought to undertake large commissions. One famed artist, working as far afield as Tibet, is the master Aranico. Many of the most famous works of Tibetan monasteries have been attributed to Nepali artists and artisans whose home was the Kathmandu Valley. Here their work is found everywhere. Over time the meanings or history of some objects has been lost or merged with later traditions. These objects and symbols are still revered and are part of the basic framework of Nepali design. Interpretations are given by those who still hold the knowledge, and given the number of religious practices in the valley there are different stories to explain any particular feature. Some coincide, whereas others provide a different way to see the work.